My Name is Mrs. Mandakini D Patel (M.Sc.M.Ed. ), I am a Principal of M. N. H. High School, Dadar. In all, I have more than 20 yrs of experience in teaching & I have been associated with this school for more than 15 yrs. 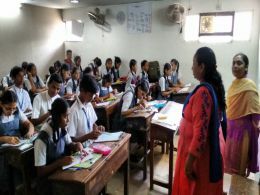 Our School is of regional language "Gujarati medium" school and the classes are from 1st to 10th.Majority Students are from the Poor Category and they cant even afford to pay their school fees and buy their school uniforms and school books.We are self funded school and get a very less support from our Trustees and government. With this Campaign I am requesting you to kindly help our school kids and help them get Education so that they can live their life in Future. Basically the requirements are very small but need your Support.School Fees, Uniforms, Text Books, Note Books, School Bags, Stationary, Shoes, and Food Items.We would be very pleased to get small contributions from you which will help these poor students for their education. A small drop of water together creates a big Ocean...so please extend your kind CONTRIBUTE, a little money from your side or at least forward our Story to your friends and relatives and urge them to DONATE. M N H High School.